This article may contain outdated information that is inaccurate for the current version of the game. It was last updated for 1.24. This page deals with combat mechanics. For information on the recruitment and maintenance of armies see army. For the individual unit types see land units. Land warfare is the deployment and maneuvering of military assets against an enemy, in most cases this results in combat between opposing armies. In EUIV most combat is land-based and, while the naval aspect of war holds importance, losing the land war is usually the main cause of defeat. The art of land warfare is therefore of significant importance, and its complexities are discussed here as fully as possible. The conclusion to a normal land battle. Combat is not only determined by mere numbers such as modifiers and dice-rolls, but through a complex simulation in which units deployed into two rows of positions for each side, allowing units to fight the enemy units in front of them, the enemies at their flanks if possible (with high enough flanking range), and move between different positions if needed. All the while, the system retreats destroyed or low-morale units and deploys reinforcements and reserves as well. The combat system, while not being entirely obvious or intuitive, can be seen through the combat interface which allows the player to see which regiment is fighting which, and which is moving where. Terrain map. Border pixels belong to the province to their southeast. Terrain for each province is shown in both the terrain and simple terrain mapmodes. Terrain shows a natural-looking map, while simple terrain color-codes each province by its terrain type; both have tooltips showing terrain type, fort level, and the current winter, if any. Some terrain imposes a movement speed penalty to armies traveling in the province in addition to a negative rough terrain modifier to the attacking army, with different types of terrain having different modifiers. Here is a list of the types of terrain and the modifiers which they grant. Crossing a river: −1 to all rolls. The presence of a river in between a province and its neighbors is indicated in the province window, through a small river icon. Mousing over this icon will show which neighboring provinces require a river to be crossed in order for an army to reach the province. Crossing a strait: −2 to all rolls. See straits for a list. Amphibious landing: −2 to all rolls. This includes an attack from sea or a landing directly with ships at port. For attackers that originate from multiple provinces, they will all receive the crossing penalty if any one of them would normally receive it alone. All crossing penalties are removed if the attacking leader has a higher maneuver rating than the defending leader. The check on leader maneuver rating is performed daily, so a high maneuver leader can still swing the tide of battle even if he joins an engagement late. Normally, the "attacker" is defined as whichever side moves into a given province last, while the "defender" is whichever one was already occupying the area. However, if a given army is besieging a province that contains a fort and is attacked by troops owned by or allied with whoever currently controls the fort, the roles are switched: the siege army is treated as the "attackers," and those attempting to break the siege are the "defenders." Attacker penalties from terrain are applied to the siege army, while attacker penalties from river/strait crossings are nullified regardless of any leaders' Maneuver pips. The player can take this into account when building forts, as well as when choosing which provinces to siege and which besieged provinces to prioritize sending their troops to. Also note that this only applies to provinces with forts. If a sieging army wins a battle on a province where they're sieging, an immediate bonus siege tick is triggered. This does not reset the ticking down for the next siege tick. This section may contain outdated information that is inaccurate for the current version of the game. The last version it was verified as up to date for was 1.24. To maximize the effectiveness of an army, a proper mixture of troops is important. Combat width determines how many units can actively participate in a battle at one time. For every 1 combat width, 1 additional regiment can be placed in the front and back rows, if sufficient troops are available. The base combat width is 15. As military technology advances, a country's combat width increases, allowing them to use more soldiers effectively at once. All countries other than Native Americans start with tech level 2 or 3, so their starting combat width will be 20. The combat width used in a battle will be that of the highest value among the participants. Here is a table of combat width by military technology level. The game uses an undocumented algorithm to automatically deploy land units on the battlefield for each side of the battle. Through observation and controlled experiments, the community has suggested a theory that the game seems to follow, dependent on the rough size and composition of each army. Deploy all infantry in the first row. Deploy as much cavalry as possible to the sides of the first row. Deploy all artillery in the second row. If there are more units in the second row than the first, then it will redeploy artillery to the first row until both rows are even. If there is still space remaining in the second row, deploy all remaining cavalry onto the second row, beginning from the edge of the first row then inwards. Deploy all infantry in first row, except for X[Unknown value] positions to each side. Deploy X units of cavalry on each side of the first row. Deploy all artillery on the second row. If space is left on the second row, deploy all remaining infantry in the second row next to the artillery, except for Y[Unknown value] positions to each side. Deploy all remaining cavalry in the second row, beginning from the edge and going inwards. Deploy all infantry in the first row that can be positioned to attack enemy units in the first row, except for X[Unknown value] positions to each side. Deploy all cavalry in the first row that can be positioned to attack the enemy units in the first row. Deploy all artillery in the second row. If space is left in the second row, deploy as much infantry in the second row besides the artillery as there are positions available behind the infantry in the first row. If space is left in the second row, deploy as much cavalry in the second row besides the infantry as there are positions available behind the cavalry in the first row. When two hostile armies meet in a province a battle will commence. A battle will last until one side is routed or annihilated. Combat is divided into a series of 3-day phases. Phases alternate between Fire and Shock, with the Fire phase happening first. Units in the front row can attack any enemy unit within their horizontal flanking range. Normally they will only engage enemies that are directly ahead of themselves, but they can sometimes execute flanking attack regardless if it will be more effective at reducing the enemy's combat ability. This typically occurs if the unit is facing an enemy artillery regiment or a particularly outdated unit; in this case the unit may choose to attack the flanks of a stronger enemy unit nearby. Artillery are the only units that can attack from the back row, but they will only deal 50% damage from that position. At the beginning of each phase, each side rolls a die. The result is used to determine the morale damage and casualties inflicted to the opponents each day in the three-day-phase. Dice roll ( ): Is a random number between 0-9, rolled for each entire side at the beginning of each phase (not each day). Leader skill ( ): The leader skill for that phase (Fire or Shock Pips). Attacking unit attack pips ( ): The attack pips for the attacking unit for the current phase, or Morale pips if computing morale damage. Note all units attack during every phase---here "attack" does not refer to which army is attacking. Defending unit defense pips: The corresponding defense pips for the defending unit. Terrain modifiers ( ): Harsh terrain may give a penalty to the attacks of the attacking army (in this case "attack" refers to the attacking side). Attacking unit strength ( ): If the attacking unit has less than its maximum of 1000 men, damage will be reduced proportionally. Attacking unit modifier ( ): Determined by unit type and military technology level and. See Technology#Cumulative mil tech effects to army. Attacking unit Combat Ability ( ): Any Combat Ability bonuses the attacking unit has. Attacking unit Discipline ( ): The Discipline of the attacking unit. Note that Discipline does also increase Military Tactics, so it increases defense indirectly. Defending unit Tactics ( ): The Tactics of the defending unit. There are several unique national ideas which modify the amount of damage inflicted and received in both the fire and shock phases. 6 base casualties translates to dealing 1% of the attacking unit's maximum morale as morale damage. Note that the modifiers may be different. Units also use their morale pips, but the pips added by the general still use shock and fire pips during the shock and fire phases respectively. Attacking unit maximum morale ( ): Note that this is the maximum morale of the attacking unit, not the current morale. After recent observations and a combat tooltip, it appears that the tech level multiplier to shock and fire damage affects morale damage as well. Military tactics reduces the amount of damage a country's troops take in combat. Military tactics is increased by military technology. It is also multiplied by discipline. Each military unit has offensive and defensive stats in three categories: fire, shock, and morale. Offensive stats are represented by yellow pips, and defensive stats by green pips. During each combat phase, each unit will use its offensive pips to increase damage dealt, and its defensive pips to mitigate damage received. This implies that offensive pips are recommended if the player fields a larger army than their opponent, and vice-versa for defensive pips. This is because a larger army with higher combat width will have a larger surface area of attack. If, say, the enemy has an army with 10 infantry and 10 artillery, and the player only has 10 infantry. The player will suffer significantly fewer casualties with defensive fire pips, because it will reduce damage from both infantry and artillery fire. Conversely, if the player has a larger army, they would want higher offensive pips on their infantry and artillery because they have 2 attacking regiments for every defending enemy regiment. The recommended pre-artillery composition with no regard to cost, consists of high proportions of cavalry and a high shock pip Leader, as tier 1 cavalry has 1 shock and 0 fire modifier, and tier 1 infantry has 0.35 fire and 0.5 shock modifier. Combined with a shock Leader, the player will inflict significantly more damage during the shock phase. This also means that defensive shock pips are recommended early game to defend the player's army from the enemy's shock damage. After military technology level 7 , the combined fire pips of tier 2 infantry and tier 1 artillery balance fire and shock pips, for both Nomadic and Civilized nations. If the player plans on recruiting an amount of artillery units equal to the length of the current combat width, a fire pip Leader is now recommended. Flanking range determines the horizontal range in which a unit may make a flanking attack. The base flanking range is 1 for infantry, and 2 for cavalry and artillery. There are military technologies which increase the flanking range of units as the game progresses. Below is a table with said military technology levels and how much they increase flanking range. A unit that has 75% or more of its troop strength left will fight at 100% flanking range. If they are in between 50 and 75% of their strength, they will fight at 75% flanking range. When between 25 and 50% strength they will fight at 50% of their flanking range. The final range is always rounded down to the nearest integer. Morale is an important factor in fighting battles. Each day of combat a unit will take a Morale hit of 0.01 or 0.02 regardless of damage taken from an enemy regiment. If it is taking casualties from an enemy, additional morale damage will be inflicted. Once an army's overall Morale value has been reduced to zero the army will attempt to retreat. Retreat cannot happen until both two fire and two shock phases have completed, so an army that has its morale reduced to 0 before that point will be destroyed. This destruction is known as a stackwipe. A unit that has its morale drop below 0.50 is flagged as disorganized, which is indicated by a small flame next to its morale bar on the map and interface. A disorganized army is unable to start moving until its morale has recovered above 0.50. Newly trained regiments at low land unit maintenance will often fall below this threshold. If an army loses a battle while having low enough morale to be disorganized, they will be forced to retreat to a controlled province (owned, allied in war, or occupied by player or allies). This province can be very far away from where the battle took place. They will prioritize to retreat to a province with high development, a fort, and no adjacent enemies. While retreating, it cannot be engaged in combat or controlled until it reaches the safer province (or in extreme circumstances if it recovers to 100% morale before reaching the destination). The army also moves slightly faster, and will recover morale at a normal rate during the retreat. If there are no available controlled provinces to retreat to within a large range, the army will shattered retreat to one province away. The army can then be immediately re-engaged, often with very low to even no morale, if a monthly tick has not yet completed. This can be devastating as an offensive tactic, but may also affect the player as well. A controlled retreat is manually ordering an army to retreat from battle after the initial fire and shock phases, and while it still has greater than 0.50 average morale. This allows the player to control the destination of the shattered retreat. If the morale of an army is less than 0.50 the player can not control the destination. If multiple armies have converged into a battle, it is possible that some armies will have enough morale for a controlled retreat, while others may not (often the initial stack in the battle). Winning a battle gives the winning armies 50% of their maximum morale and retreating from a battle will reduce the other allied armies' morale relative to the portion of troops leaving the engagement). After a battle is fought, an army must spend some time without fighting for its morale to recover. The normal morale recovery on the 1st of every month can not occur while in combat. Army Maintenance: Ranging from 0.51 at minimum maintenance to the defined maximum at maximum maintenance. Galician idea 5: Santiago y Cierra! Every month, a regiment recovers 15% of its maximum morale. The following contributes to a nation's morale recovery speed. Armies that win battles will gain a significant boost to morale, to prevent situations where an army is stack wiped due to winning a narrowly fought battle and then immediately being attacked. The amount of morale regained depends on the strength of the enemy army defeated relative to their own strength. Armies exceeding their nation's ratio of cavalry to infantry receive the "insufficient support" penalty which applies a −25% military tactics to those armies until their ratio has been restored to normal. This ratio threshold is checked daily even during battles, and is based on the actual headcount of individual soldiers instead of regiments. Since infantry tends to take more casualties than cavalry, it is advisable to take at least a bit more infantry than the ratio would suggest. Forts are used to protect a nation from invading armies. Fort buildings: +2 fort level per building level. Each building level of fort costs 1 ducat per month. Forts can be mothballed by the nation that controls them; mothballing will reduce the fort maintenance by half but remove fort level and the current garrison from the city. A fort cannot be mothballed or de-mothballed while the city is under siege. The garrison will recover at a normal rate after mothballing is cancelled. Capital cities always have fort level at least 1, which stacks with any fort building in the province; this free fort level does not extend a zone of control, does not cost maintenance, and cannot be mothballed. A fort building in a capital province can be mothballed as normal, but the free fort will remain. The Monastic Order government also gives −20% Fort maintenance modifier. The Age of Absolutism Protecting Forts ability give −100% Fort maintenance modifier if they are on a border with a rival. Active fort buildings (not counting the free fort level in the capital) provide a zone of control. A zone of control restricts the movement of enemy armies through the province with the fort, and provinces immediately adjacent to it. When an army enters a zone of control from a province not affected by a hostile zone of control the province it entered from is set as the 'return province'. In general the army can then only move to another province that has no more than one province that is not affected by a hostile zone of control between itself and the return province. The main exception to this rule is that the army can always move to a hostile fort. Please see the main article for full details as there are a number of exceptions and the behaviour is not intuitive. When hostile troops enter a province and stop moving, a siege/occupation will begin. To progress, the attacker requires a minimum of 3000 men per 1000 garrison. If the province has no garrison (whether because it has no fort or the fort's garrison is empty), 1000 men is enough and occupation is guaranteed within a month. Any unit types can be used for sieging, but for sieging a fortified province, only infantry will be used in an assault, and artillery speeds the siege up (see below). Progress in a siege will never decrease as long as attackers are continuously present; however, if all attackers leave the province, you will lose 1 siege status progress per day the province is unsieged. Besieging armies will always take at least 1% base attrition, even if the province is unfortified. This rule only applies to enemy-owned provinces, however - when besieging friendly provinces to retake them from the enemy, this rule is ignored. A besieging army always count as the attacker and will receive the province penalty and, depending on the way they entered the province, an additional crossing penalty when a battle takes place. Available only with the Art of War DLC enabled. The garrison can be ordered to make a sortie to fight the hostile army, at the cost of 10 military power. (The ‘Sortie from siege’ button is shown on the siege screen.) If the garrison army, which consists only of infantry, loses the fight the province and fort will become occupied. This can be used to win a battle in which both sides are evenly matched. Tactics difference: 6.25% per 0.25 military tactics difference to both sides. E.G. If the player's tactics is 0.5 higher than the enemy, the player's siege will be 12.5% faster and the enemy's siege will be 12.5% slower. Only the base tactics value counts, bonuses from discipline have no effect on phase time. A siege dice roll is also triggered if the sieging army wins a battle on the besieged province. Guarani idea 6: Repel the Bandeirantes! Certain events can temporarily increase siege ability or fort defense. "Sieges per year" is computed at the default phase length of 30 days. Siege status. The most important modifier. As the siege goes on, this bonus will increase from its starting value of 0 depending on previous dice rolls. The maximum starts at 12 for a Castle or capital fort and is increased by 1 for each building level above a Castle, up to a maximum of 15 for a Fortress. Leader siege. If the attacking army has a leader, the leader's siege skill (+0–6) is added as a bonus. Artillery. Adding artillery to a siege will add a +1 to +5 bonus. A single regiment of artillery will always give at least a +1 bonus, regardless of fort level. Each 1000 artillery soldiers count as 1 artillery. e.g. having 10 regiments with 100 artillery each is the same as 1 regiment with 1000. Blockade. If the province is coastal and not completely blockaded, a −2 penalty is applied, or −1 if the attacker is the rightful owner of the province. 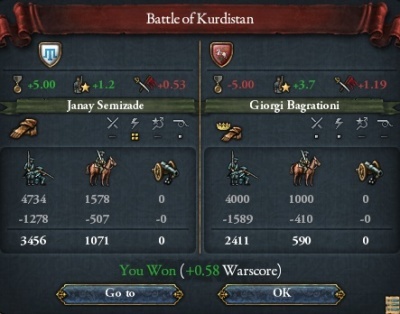 Partial blockades (anything less than 100% for the province in question) have no effect on sieges. Note that the blockading fleet doesn't have to be owned by the same nation as the sieging army, or even a part of the same war to help in a siege. Fort Level. The defender's Fort Level is applied as a penalty. Obsolete Fort: If the attacker's technology allows the building of more advanced forts, they gain a bonus +1 per fort level difference to siegeing old forts. e. g. If attacker can build Star Forts (building level 3) and is sieging a Castle (building level 1), they gain a +2 bonus to dice rolls. Insufficient Garrison: Having less than half of the maximum garrison gives the attacker a +1 bonus. If the fort has no garrison whatsoever (i.e., if the fort has been mothballed during this month), then the province is treated as unfortified and the siege will automatically succeed. Walls Breached. Each time the walls are breached, the breach status value will increase by 1, to a maximum of +3. If this value is at least +1, then the fort can also be assaulted (see below). The highest possible starting bonus is +17: a capital fort (−1), obsolete by 3 fort levels (+3), with an insufficient garrison (+1), with a 6-siege general (+6) and at least 8 regiments of artillery (+8). The worst possible starting bonus is −11, for a level 8 fort in a capital (−9) with no blockade (−2). The die roll may result in an increase of the siege status, which improves the results of future siege stages. Maximum siege status values goes up with the attacker's maximum fort building level. (12/13/14/15 for fort building level 1/2/3/4). Maximum breach status is always 3. If the unmodified roll is 1, a Disease Outbreak happens—the attacking army loses 5% of its troops, and the siege does not progress (a surrender takes priority over a Disease Outbreak). Then look up the modified die roll on the table below. The attacker needs at least a net +6 bonus to have a chance of ending the siege. The option to conduct an artillery barrage becomes available when a siege has at least one full artillery regiment per fort level. This costs 50 military power and creates 3 breaches in the walls. In total, these add +3 permanent siege status. Rolling a natural breach is still possible and will affect the siege status but will not add another breach. The attacker may choose to assault the garrison with their infantry if the walls have been breached at least once. This can result in a speedy conclusion of the siege at the cost of 5 military power, and usually costs lots of lives. The attacker loses roughly 5 times as many troops as defender do and assaults on fully-manned forts are highly discouraged. Only infantry can assault. If all infantry units of the attacker are killed before the defenders are defeated, the remaining cavalry and artillery will continue the siege normally. Only men can be part of an assault per day. An exiled army can be identified by a black flag attached to its unit icon. It can't fight, siege provinces or explore, and it won't lift fog of war even in the province it's in. However, it can traverse any territory (other than wasteland) without needing military access. It still suffers attrition and its regiments can still move between armies, though regiments can't be mixed between exiled and non-exiled armies. When a war ends, any army still in territory it doesn't have peacetime access to is exiled. This prevents it from being permanently stuck in a place it can't get out of, as well as preventing several exploits. When a war begins, any army in a neutral or hostile province that it only had access to through a military access agreement is exiled. This prevents troops from being placed outside their country's territory in preparation for war. An army in uncolonized land or the territory of a subject or ally won't be exiled, even if the ally isn't called into the war. When a native tribe migrates, any armies that happen to be in the province it migrated to at the time and don't otherwise have access are exiled. boards a transport ship that moves into a sea zone or is currently in one. If an army is in combat when it gets exiled, the battle will end only if all of its enemies are no longer hostile. For example, if an army is fighting rebels in enemy territory when peace is signed, they will continue fighting despite being exiled. Every province has a loot bar. This is the amount of gold available to be looted in the province and is determined by its development level: a province will gain 1 gold for every increase of 1 development level. The player can loot provinces they occupy or those which they are sieging, but troops must be present to do so. The amount of loot taken depends on the number and type of troops in the province. A full strength infantry/cavalry/artillery regiment loots 0.1/0.3/0.05 ducats per months. When a province's loot bar is empty no more loot can be taken from that province. A province will only begin to recover two years after the last successful looting, at a rate of 10% each month. Looting is the main cause of devastation, which greatly reduces the owner's production income and manpower, as well as decreasing movement speed, supply limits and institution spread. Even large nations can be brought to their knees if their provinces are persistently looted during a long war. Various ideas increase looting speed; this bonus increases the amount of ducats looted each month by the stated amount (and thus decreases the time taken to fully loot a province). This action attaches the player's army to a friendly army, causing their army to travel and fight alongside the friendly unit without further input from the player. The army can be detached at any time except in battle. An attached army cannot board transports. Attaching units to an AI army will change its behavior, making it bolder and more willing to actively engage enemies. The native population of a colony or uncolonized province can be eliminated using the attack natives military action. A native army equal in size to the local native population (rounded to the nearest thousand) will spawn immediately and must be defeated in battle to clear out the native population. This action costs military power proportional to the native population, aggressiveness, and ferocity, and will permanently reduce the potential value of the province from the native assimilation bonus. The elimination of all natives in a province will prevent any future raids on the local colony or any passing armies. Scorching the earth can be useful when the player's army is too weak military to fend off attackers and their provinces are likely to be occupied. It increases attrition (hurting the enemy's manpower), and makes the provinces less valuable to the attacker while they're occupying them. The player will lose income in the meantime, but if they were going to lose control of them anyway it could be a good idea to make them less valuable for the enemy. Clicking the Automatic Rebel Suppression icon in a selected army panel will set the army to automatically travel to and fight rebel armies that appear in its surroundings. The army will return to its previous position after the rebels are dispatched. Armies that are ordered to move will stop suppressing rebels. Units set to auto suppression reduce unrest by a greater amount than normal. Forced march makes an army move 50% faster, but costs 2 military power for each province the army marches through. Forced march is available at administrative technology 15. Armies that are forced marching do not recover morale. During Age of Revolutions it is possible to enable Improved Force March ability, which reduces military power cost to 0 (requires Mandate of Heaven). ↑ "During the Shock phase and after the dice roll and other modifiers have been added together, the unit makes an attack on an enemy unit. The Shock Modifier directly affects damage dealt to morale and number of casualties inflicted." "During the Fire phase and after the dice roll and other modifiers have been added together, the unit makes an attack on an enemy unit. The Fire Modifier directly affects damage dealt to morale and number of casualties inflicted." ↑ See in /Europa Universalis IV/common/defines.lua under INF_LOOT, CAV_LOOT and ART_LOOT. ↑ See in /Europa Universalis IV/common/static_modifiers/00_static_modifiers.txt (Static modifiers#Scorched Earth). This page was last edited on 23 March 2019, at 13:26.